MEMBERS OF THE government have met with some of the country’s biggest insurers over claims customers were left shortchanged over compensation payouts following Storm Ophelia and Storm Emma. Minister of State at the Department of Finance Michael D’Arcy along with department officials met with the insurance companies to highlight the negative feedback he’d received from policyholders over claims they made in relation to the storms. The insurance industry, however, rejects these assertions, with a spokesperson telling the TheJournal.ie they are “anecdotal and untested”. D’Arcy told the Irish Independent last month that there had been “too many examples of the 20% being withheld”, referring to instances where companies would pay out 80% of a claim but retain the rest subject to a site inspection. Red Alert weather warnings were issued for Storm Ophelia and Storm Emma in October 2017 and February 2018, respectively. 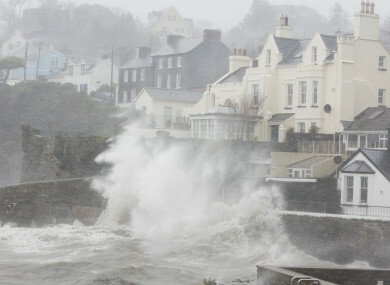 The weather wreaked havoc across Ireland, causing extensive damage to property and roads. In response to a parliamentary question last week from Fianna Fáil’s finance spokesperson Michael McGrath, Minister for Finance Paschal Donohoe said that D’Arcy had requested the department analyse how insurance claims were managed in the aftermath of the storms. As well as giving the negative feedback he’d received to insurance companies, D’Arcy also met with representatives of loss assessors and a number of insurance brokers from an area that was heavily impacted by Storm Emma. “A summary was prepared following these meetings outlining an analysis of some of the points raised during the meetings,” Donohoe said. This was presented to the minister of state for his consideration and in response he has asked that his concerns be further examined by members of the Cost of Insurance Working Group over the coming weeks. The Insurance Ireland spokesperson told TheJournal.ie that its members processed 12,000 claims, costing approximately €85 million across Storms Ophelia and Emma. “The Minister’s reported comments did not tally with our experience, or that of our members, and we sought a meeting with the Minister to reconcile his position with our sector’s experience during these events,” the spokesperson said. Insurers believe the policy of retention payments, where an advance is paid to allow reinstatement works to commence with the final bill paid by the insurer on receipt of invoices, is important to ensure works are completed to the required specification and all obligations, such as the payment of VAT, have been made. McGrath also asked Donohoe if legislation was planned to prohibit insurance companies from underpaying customers following extreme weather events. The minister said no such legislation is planned. Email “Minister meets insurers amid claims customers left underpaid following Storm Ophelia and Emma”. Feedback on “Minister meets insurers amid claims customers left underpaid following Storm Ophelia and Emma”.